FF Attribute™ actually first saw the light of day during a private project – it was Viktor Nübel’s aim to create an appealing text editor font. Used in this context as a rule are characters with a standardized width, so Viktor Nübel created character shapes similar to those produced using a vintage typewriter. To achieve this Nübel has provided his ‘i’, for example, with generous serifs while the ‘l’ is particularly curvilinear to ensure it takes up as much room as possible and occupies the same space as the other letters. Text editor programs also require clearly defined, readily distinctive characters, and Nübel has made sure this is the case when it comes to the ‘1’, ‘I’ and ‘l’. 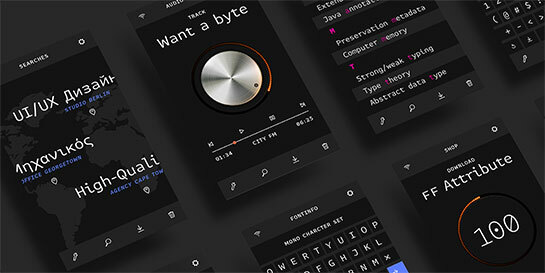 After the initial phase, the project progressed rapidly and his concept took on more than just the features of a normal text editor typeface, growing into a full font family with numerous different weights, including even an italic version. The result is the new FF Attribute Mono with its seven weights, from Thin to Black, each with corresponding italic versions. The assortment of characters – unusually extensive for a monospaced family – incorporates Greek and Cyrillic characters, Vietnamese graphemes and even small caps. Moreover, Viktor Nübel has provided alternative character styles in the form of pictograms and ornamentations. When it comes to his FF Attribute Text, the designer has moved even further away from the concept of a text editor font by creating a proportional version of his typeface. However, the changes he has made to his characters are minor only, so that the feel of a monospaced font is retained but a more relaxed typographic effect is produced. FF Attribute Text also has seven weights, just like the Mono version. Thanks to their contemporary range of characters, the two FF Attribute families are the perfect choice not just for writing software programs but also for text and design applications. The legibility of the typefaces is perfect even in the smaller point sizes – not to mention on the computer screen – while their unique and individual character comes to the fore in the larger sizes. Through the effects associated with office communication, vintage typewriter and text editor typefaces, FF Attribute will provide marked contrasts in warm and organic text designs.